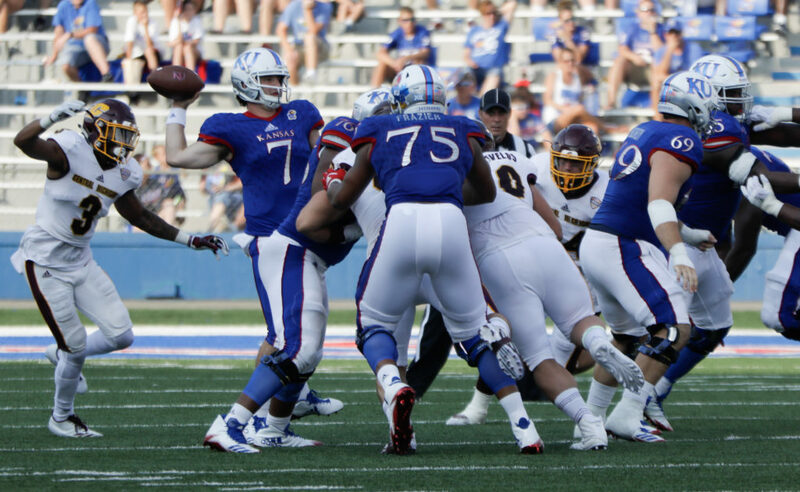 Kansas quarterback Peyton Bender (7) passes while under pressure from the CMU defense during the Jayhawks game against Central Michigan Saturday, Sept. 9, 2017, at Memorial Stadium. 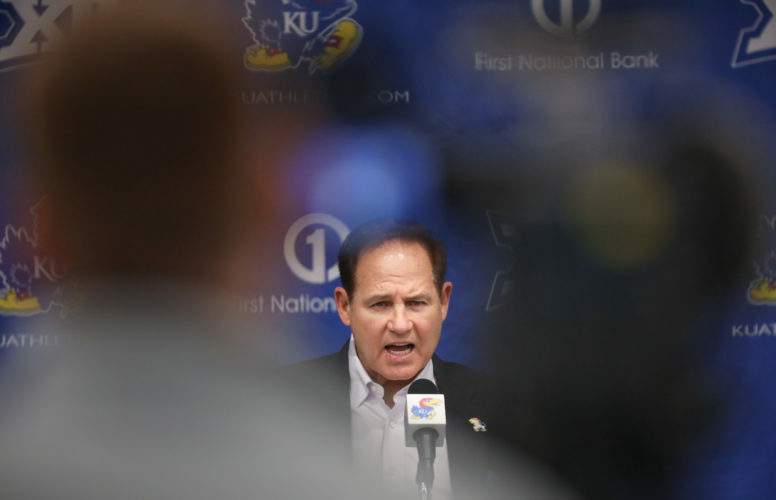 David Beaty fired offensive coordinator and quarterbacks coach Doug Meacham during the bye week and took over Meacham’s responsibilities. 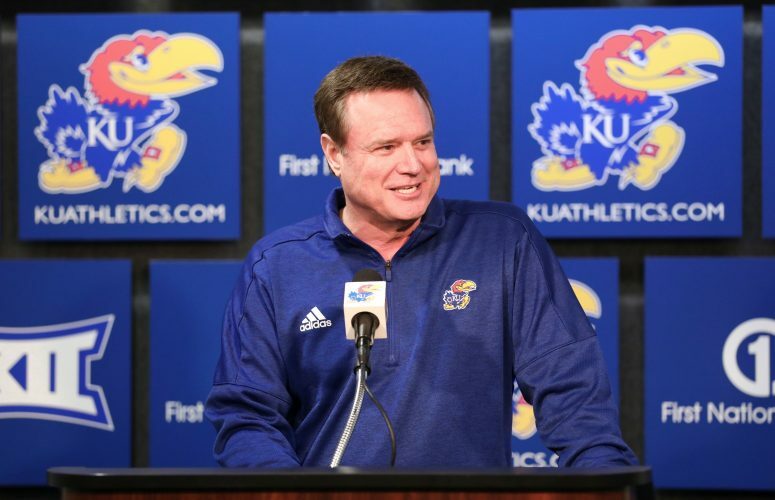 Now is the fourth-year Kansas head coach’s first chance to prove that move is one capable of invigorating his team. 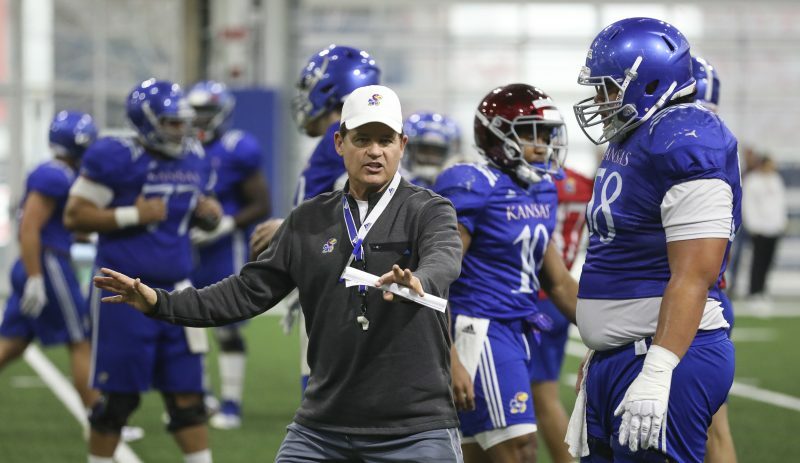 What exactly will look different about the Jayhawks’ offense with Beaty coaching the QBs and calling plays? We’ll find out during KU’s trip to Lubbock, Texas, because he was intentionally vague about it in the days leading up to its debut. A former colleague of Beaty’s, Texas Tech head coach Kliff Kingsbury, said KU’s coordination switchup made the Red Raiders rethink their defensive preparation. Regardless of what tactics they take to get there, the Jayhawks have to show improvement offensively. In conference games, KU ranks 10th in the Big 12 in total offense (308.3 yards per game), passing yards per completion (9.9) and rushing yards per game (107.7), ninth in passing yards (200.7 per game) and eighth in passing yards per attempt (6.5) and rushing yards per carry (3.8). KU’s defense has played well enough at times for the offense to feel some pressure to improve. What’s more routine than handing the ball off to your most talented skill player? In KU’s loss at West Virginia two weeks ago, freshman running back Pooka Williams carried the ball 12 times — a season low for the breakout performer, who has delivered eight rushes of 20-plus yards in five games. Averaging 7.5 yards per rush attempt on the season, Williams, whom Kingsbury said has “kind of taken this league by storm,” needs the ball in his hands as often as possible for KU’s offense to reach its potential. Texas Tech senior safety Jah’Shawn Johnson told reporters earlier this week the Red Raiders’ defense is expecting KU to get the ball to Williams. If Beaty was willing to make a move as drastic as firing Meacham in the middle of the season, one would think he wouldn’t mind doing something as simple as featuring Williams more prominently in the offense. Neither Beaty, Bender nor linebacker Joe Dineen completed his media sessions this week without bringing up third downs — clearly a point of emphasis for the Jayhawks during their midseason bye week. The KU offense hasn’t lived in three-and-out land this season as it so often did in Beaty’s first three seasons. The Jayhawks went three plays and a punt five times against both Nicholls State and Oklahoma State, but did so just a combined nine times in their other four games. Of course, the primary job of the offense is to put points on the board, and KU has to get itself in position to accomplish that by extending drives on third downs. In the first half of the season Kansas picked up first downs on third-down plays on 29 out of 85 attempts (34.1 percent) — a rate that ranks 110th nationally. There’s some potential bad news for the Jayhawks on that front, too: Tech opponents have only converted on 31.5 percent of their third downs, giving the Red Raiders the 20th-best third-down defense nationally. Opposing offenses are 34 of 83 on third downs (41 percent, 88th nationally) against KU, while the Red Raiders are one of the country’s best offenses on third downs, extending drives on 46 of 96 such attempts (47.9 percent, 18th). It looks as if, due to an injury suffered by freshman Tech quarterback Alan Bowman on Sept. 29 against West Virginia, the Jayhawks won’t have to face Texas Tech’s offense at its best. Bowman had completed 69.3 percent of his 199 throws for 1,680 yards and 11 touchdowns, with three interceptions, before getting knocked out of the lineup with a partially collapsed lung. Kingsbury indicated earlier in the week Bowman had not yet fully participated in practice. That means KU could see dual-threat QB Jett Duffey, who started in Tech’s win over TCU, or McLane Carter, who started the season opener. Though he has played in only three of the Red Raiders’ six games so far, Duffey is the team’s second leading rusher, averaging 83.3 yards per game on the ground and 6.8 yards per carry, with three rushing TDs. As a passer, Duffey has connected on 36 of 60 passes (60 percent), for 455 yards and two TDs, with four picks. Duffey scored the game-winning touchdown for Tech at TCU on a 38-yard run midway through the fourth quarter. Kingsbury said the 6-foot-1 redshirt sophomore showed enough in the second half to give the offense something off which it could build. Carter, a junior, only has attempted 10 passes on the season, so it seems Duffey is the most likely QB to play against KU. 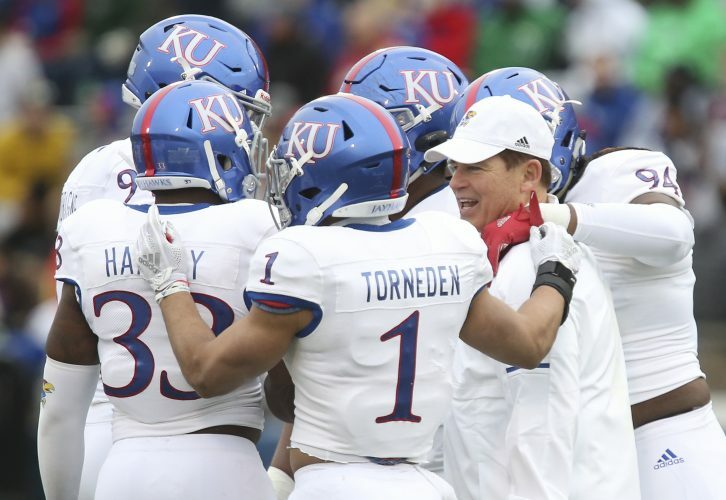 With his relative inexperience, KU’s defensive backs will need to confuse Duffey when possible, with the help of some defensive line pressure, of course, and find ways to possess any errant passes made in their direction. With Duffey’s ability to scramble and/or take off and run if the coverage doesn’t give him passing lanes, it will be on KU’s linebackers to keep an eye on him and make sure he doesn’t turn a busted play into a huge one for Tech’s offense. The deeper KU gets into the season, the more it feels like like do-or-die time for Beaty, as evidenced by his firing of Meacham. 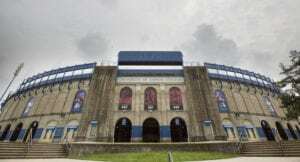 Only six games remain on the schedule, and for Beaty, those are six opportunities to convince his boss, KU athletic director Jeff Long, to keep the football coach in place for a fifth season. Beaty has won just five games since taking over the long struggling program before the 2015 season, and he has lost 37 (a .119 winning percentage). The program hasn’t won a true Big 12 road game since Beaty was a receivers coach on Mark Mangino’s staff in 2008. That road losing streak, obviously not all on Beaty’s watch, sits at 42 games. Perhaps a drastic turnaround by the offense, a few wins for the constant underdogs and a rare gem of a road victory between now and the finale on Black Friday could save Beaty’s job. Finding a way to defeat a borderline top 25 team in Texas Tech on the road would be a significant step in the right direction for the embattled coach.